360 video simply isn’t enough to ‘wow’ a crowd anymore. Deeper immersion–whether by 3D video, 6DOF or spatial audio–is almost a requirement these days. 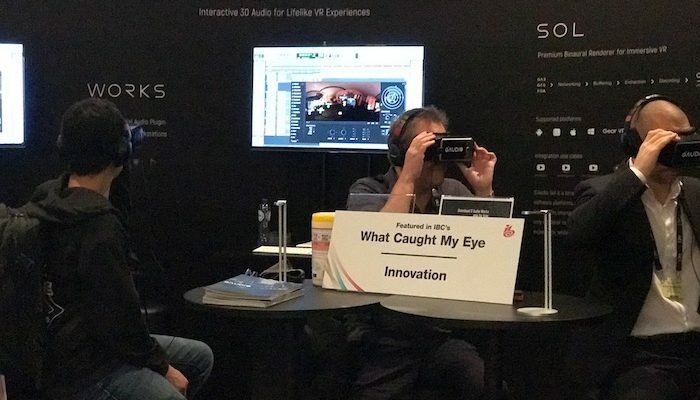 That’ what makes G’Audio‘s free spatial audio plugins one of IBC’s “What Caught My Eye” products (seriously, that’s a thing–not just my opinion). G’Audio’s suite of plug-ins include G’Audio Works and G’Audio Craft , which allow a user to manually place and move a sound within ad 360 environment (with Works) and within a 3-dimensional 6DOF environment (Craft). The user can literally watch and re-watch their immersive experience, manually dragging sounds to follow the object in the scene throughout the video clip. This is better demonstrated in the video above.